We can see so many dogs are strained and left uncared in street. They are often ignored and tortured. 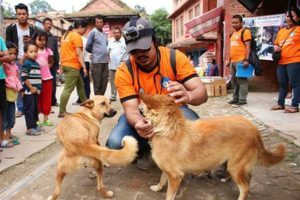 Kay Garnay started this project with the collaboration of Bhaktapur Animals Welfare Society(BAWS). We have dog sterilized to keep the number of dogs in control and to take care of the existing dogs properly. We can see many dogs coming in guest house, we feed them daily.We had a great day celebration in Rabies day. Street dogs were injected to fight against the rabies virus. Kay Garnay is expecting to help more in future and collaborate with different organizations which works to take under the control of such problems. Reason for this need: Throughout recent years there are typically more than 4 shortages of cooking fuel per year in the Kathmandu Valley. The current crisis has gone on for over 4 months causing most local restaurants to close. The Kathmandu Valley enjoys lovely bands of forest throughout, but now people are cutting the forests to build shelters due to the recent earthquakes or for cooking. If they are provided instructions and materials our research indicates that the Nepali people are willing and eager to explore other options. They have a clear understanding for the need of environmental preservation, but are helpless to make changes. 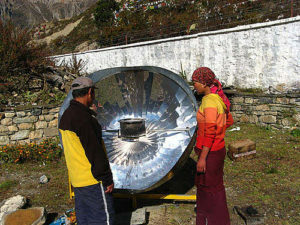 Helping the people to transition to solar cooking will help to preserve the forests, as well improve the health of families who cook on wood without a chimney. Summary: You will demonstrate how to make and use solar products for cooking in a community project. Villagers will be able to learn and practice safely cooking with this type of cooking method with their own solar stove and oven that they make at the workshop. Everyone will enjoy a community meal afterwards so everyone understands how to use it. After you make your stove with the people, who will each make their own, you will all make a meal and their family members will bring their own dishes and pans; we will all enjoy a community meal together. Although many of the people will pay a small amount to cover a portion of the cost of the supplies, no one will be turned away. By asking people to pay a small amount and having them make one and training them on the proper use, they will appreciate it more and be able to transition more easily to this kind of cooking. We believe actions speak louder then words.